1.1. Seven in ten registered voters think global warming is happening. 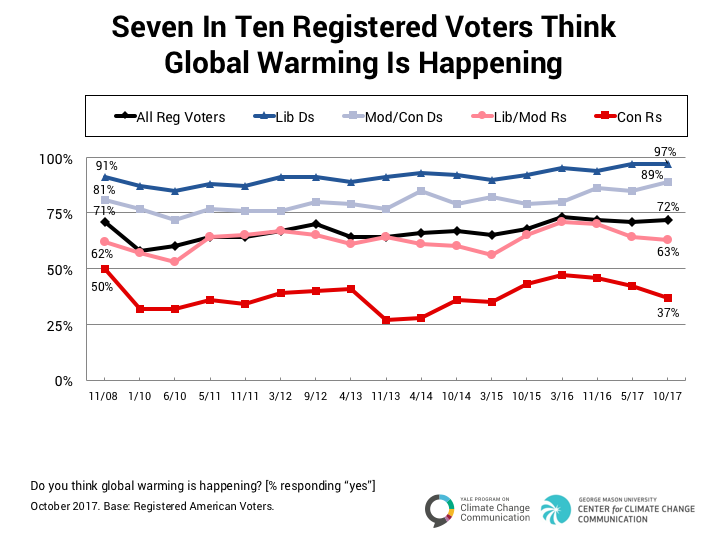 Seven in ten registered voters (72%) think global warming is happening. This includes nearly all liberal Democrats (97%; six percentage points higher than in our first survey in 2008), about nine in ten moderate/conservative Democrats (89%; eight points higher than in 2008), and a majority of liberal/moderate Republicans (63%). In contrast, fewer than half of conservative Republicans (37%) think global warming is happening – 13 percentage points lower than in 2008, and 9 points lower than one year ago, just after the election of President Trump. (see Data Tables). 1.2. 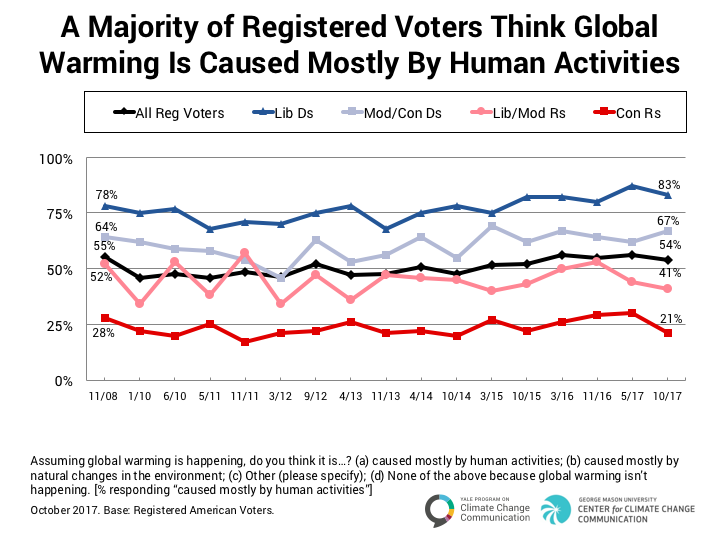 A majority of registered voters think global warming is caused mostly by human activities. A majority of registered voters (54%) think global warming is caused mostly by human activities. This includes a large majority of liberal Democrats (83%; five percentage points higher than in our first survey in 2008, but four percentage points lower than in our previous survey in May 2017 – see Data Tables). A majority of moderate/conservative Democrats (67%) also think global warming is mostly human-caused. Fewer than half of liberal/moderate Republicans (41%; 11 points lower than in 2008) think global warming is caused mostly by human activities. Only two in ten conservative Republicans (21%) think global warming is mostly human-caused, a decrease of nine points since May. 1.3. About six in ten registered voters are worried about global warming. 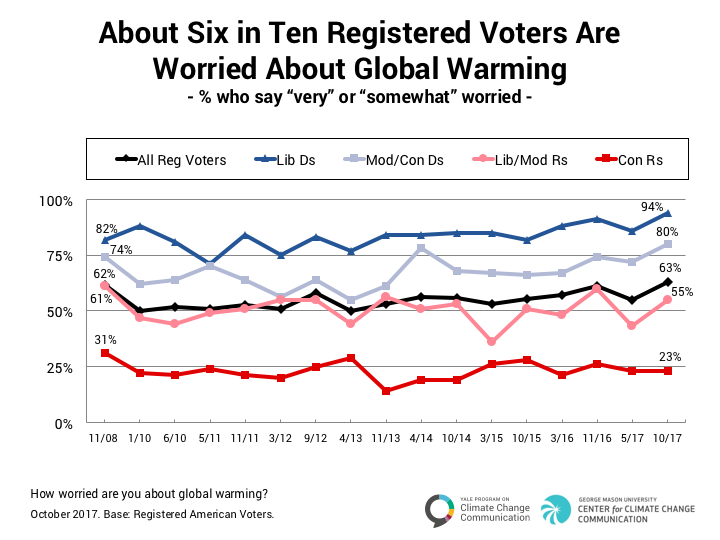 A majority of registered voters (63%; eight points higher than in our previous survey in May, 2017; see Data Tables) are “very” or “somewhat” worried about global warming. This includes large majorities of liberal Democrats (94%; eight points higher than in May) and moderate/conservative Democrats (80%; also an eight-point increase). More than half of liberal/moderate Republicans (55%; 12 points higher than in May) are worried about global warming. About one in four conservative Republicans (23%) are worried about global warming. Read the Next Section Online 2. Should the United States Act on Global Warming? Leiserowitz, A., Maibach, E., Roser-Renouf, C., Rosenthal, S., Cutler, M., & Kotcher, J. (2017). Politics & Global Warming, October 2017. Yale University and George Mason University. New Haven, CT: Yale Program on Climate Change Communication. The research was funded by the 11th Hour Project, the Energy Foundation, the Grantham Foundation, and the MacArthur Foundation.